Stebel Truck Horn Black, E-mærket. Leveringstid 3-6 arbejds dage. E-Mærket. Hornet skal sidde "i læ" ikke direkte udsat for vand. We have adapted our innovative patented "Nautilus" technology to create a new air horn. Only 10cm wide, it is able to emit 110dB (measured at 2 meters) at an "earthquaking" frequency of 300 Hz. Up until now, this same frequency performance could be reached only by using "trombones" of almost 50cm in length and the obvious placement difficulties that come with such bulky items. 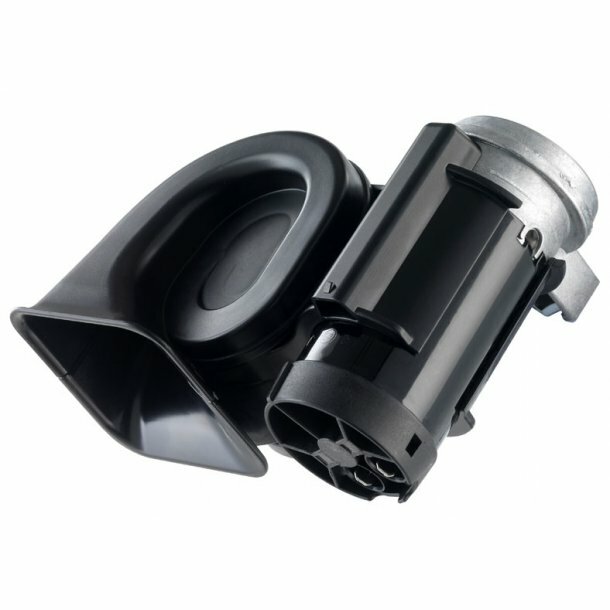 The Stebel Compact truck Horn does not require complex connections to the vehicle's compressed air chamber because it features an incoporated mini-compressor with a totally independent capability. Particularly suited for mountings "under the hood" .